The main focus of Decipher Your Quilt will be to allow all of us to better understand quilt blocks. Jess from Elven Garden Quilts and I are going to start this week with one of the simplest quilt units, the 2 patch. When I speak about a 2 or 4 or 9, etc., patch, I am referring to a grouping of quilt pieces that repeats in the overall quilt pattern or patterns. A patch, or a unit, might be the quilt block used in the quilt or it might be part of a larger block made up of more than one units. That block above, for example, is made up of 16 two patch units - the half square triangles are the smallest repeating unit in the block and it has no other differently shaped units in its composition. Two patches are easy, they are blocks or units with only two parts. Generally speaking the 2 patches I work with are square after the two parts are sewn together, although this is not always required. My favourite 2 patch is the half square triangle or HST. It is made up of two triangles, each with two sides which meet at a 90 degree angle and a third side which is on an angle from corner to corner of the square that results when two of these triangles are sewn together. Math tells us that the angle at which that diagonal line meets the other two lines in the triangle is 45 degrees. Math can also tell us the length of that line if we know how long the sides of the resulting square is, but frankly, quilters don't often need to make that calculation. The triangle pieces stretch really easy because the angled line is cut on the bias of the fabric. Once the triangles are stretched it is hard to sew them together and get a nice flat seam. It seems hard to figure out how big to make the fabric pieces to get the size of HST you require. It is hard to make consistently sized HSTs so generally the units require trimming after they are made. Quilters are so amazing to me because they have taken the time, over the years, to figure out great tricks of geometry for making quilt units and blocks. The HST is a great example. I know five ways to make HSTs which I will share with you and I am sure that there must be even more ways than this. 1. Cut triangles and sew together. This method is the most straightforward and if you have a cutting machine to cut the triangles it is a good one to use. However, until those triangles are sewn together, they can stretch so try to handle them as little as possible until then. I have to admit I never use this method and thus have no pictures for you, oops. For example, if I want 3" finished HSTs (like in that Ocean Waves block above) then I would cut triangles with two equal length sides (the sides touching the 90 degree angle) of 3" + 3/8" + 1/2" = 3 7/8". It is hard to easily cut 3 7/8" so if you are not using a cutting machine, but prefer this method, you will want to cut your triangles with the equal sides to be at least 4" or larger and then trim them down to 3 1/2" squares. Take two squares of fabric and place them right sides together. Draw a line corner to corner on the back of one of them. Stitch 1/4" away from that line on both sides of the line. Cut along the line and press the unit open. Trim the unit down to the size you need. The usual basic measurement is to cut the squares 7/8" larger than the finished size of the HST unit you want or 3/8" larger than the unfinished size of the unit you need. This is based on the same logic as the calculations for sewing two triangles together. However I just make the two squares 1" larger than the finished size I need as that gives me just a little more extra fabric to accurately trim them, and a little more room for my stitch line to be less than perfectly 1/4" from the drawn line. Also, it is much easier to measure and cut at 1" increments. I generally use this method the most because I never have to handle the bias edge of the fabric as the HST is already sewn together on the bias edge when I cut it. Also, I don't get too many identical HST units. Take two squares of fabric and place them right sides together. Sew a 1/4" seam all the way around the square. Cut apart from corner to corner. Place the pieces carefully back together and cut apart again from the other corner to corner. Press and handle the units carefully as each one has every edge cut on the bias. Trim the units to size. In the photo above you can see me using my favourite trimming ruler, the Bloc Loc. I have found this product worth the investment, especially if you are trimming a lot of HSTs and get tired trying to hold the regular ruler in place for trimming. 10" layer cake squares will give you four HST units that can be trimmed to 6.5" unfinished squares. Alyce at Blossom Hearts Quilts has a lovely tutorial complete with all the calculations here, should you wish to make other sizes using this method. I plan to immediately sew the units together with each other or with other units so that they don't start stretching on their bias edge. Take two squares of fabric and place them right sides together. Draw a line corner to corner and then another line corner to corner. Stitch 1/4" away from both lines on both sides of the lines. Cut along the lines and carefully line the pieces back together after both cuts. Then cut at the mid point of each side to the midpoint of the other side, through the intersection of the lines. You will have made 4 cuts in all. Press the resulting HSTs and trim to size. The measurements are very similar to those in method 2. Add 7/8" to your desired finished size of the HST unit and multiply that by 2 and that will give you the length of the sides of your starting squares. However, if you want a bit more trimming room (like I always do) simply take the size of the finished HSTs you want, add 1" and multiply that by 2. For example, if I want 3" finished HST units in my block, the calculation is 3" + 1 = 4 x 2 = 8. Start with 8" squares of fabric. Or, if I have two 10" layer cake squares, using this method I will get 4" finished HST units (4" + 1 = 5 x 2 = 10" starting squares). This is a great method when a lot of identical HSTs are required and and I have larger pieces of the starting fabrics. It works well when you have layer cake, for example. It has the advantage of the HSTs having no bias edges but you have all the units with the same two fabrics. It feels faster than method 2 above (two squares make two HSTs) although I am not sure it is any faster in actual practice. The cutting can be trickier as you need to keep all the cut bits in place and you still have to trim all 8 of the resulting HST units. Draw the size square you want the HST unit to finish at on a paper and add a 1/4" seam allowance on all sides. Draw a line corner to corner on the paper. Paper piece the unit. Press and remove the paper. This method will allow you get perfect HSTs and you will do the trimming around the paper as a paper piecing step. However, it is a lot of trouble to make a unit that is easy to piece without paper, unless you are making the HST as part of a larger paper pieced block. Thangles: I have not tried this product but many people love it. If you are looking for a project to use your HSTs for, you can find the tutorial for my Modern Tote Bag here. You can also find many beautiful practice blocks that use HSTs in Jess's Modern Sampler QAL, which is here. If you give any of these HST methods a try, or make any of the practice projects, please share your photos in our flickr group. Another simple and easy 2 patch unit is a square made up of two rectangles. I recently played with these units and you can read more about that here. The trick of this 2 patch is that you use rectangles to make a square, which then gives you so many design possibilities. To get a square, you need to size the rectangles so that the width (short side) of the rectangle is half as long as the long side of the rectangle plus 1/4" for the seam allowance. My rectangles in the photo above are 3 1/2" x 2 3/4" so that the two patch finishes as a 3" square. The other two patch units that I use from time to time are quarter circle drunkard's path units (and we have a post about circles later where I will discuss how to make them) and rectangular shaped two patches - eg. two rectangles, two squares or two triangles that finish in a rectangle shape. If you have other favourite 2 patch units, feel free to share them in the comments or in our flickr group. You can always make a test unit out of paper or fabric scraps to see if the resulting units finishes at the size you want. Consider a test unit before you cut hundreds of triangles or squares out and find them to be too small. If your bias edges get warped from handling them, spray them with water and leave them on a flat surface to dry. They should return to normal, or much closer to normal after they have dried. This also works to take the stretch out of the edge of fabrics you have torn apart, not cut, but don't want to throw in the washer. If you make a bunch of HSTs that are too small by a smidge, remember that they can be trimmed smaller yet for another project, so don't throw them out. It is almost never worth it to rip apart your HSTs if they are sewn wrong, it is usually faster to just make more, unless you are out of fabric. Another trimming method for HSTs that looks excellent is to trim them before you press the unit open. An excellent tutorial is here at Little Miss Shabby. There are several ideas and products that provide guides for your fabrics to avoid having to mark the lines on your HSTs. I have yet to try them but it is on my list of things to do. Let me know if you have a favourite one that works easily. 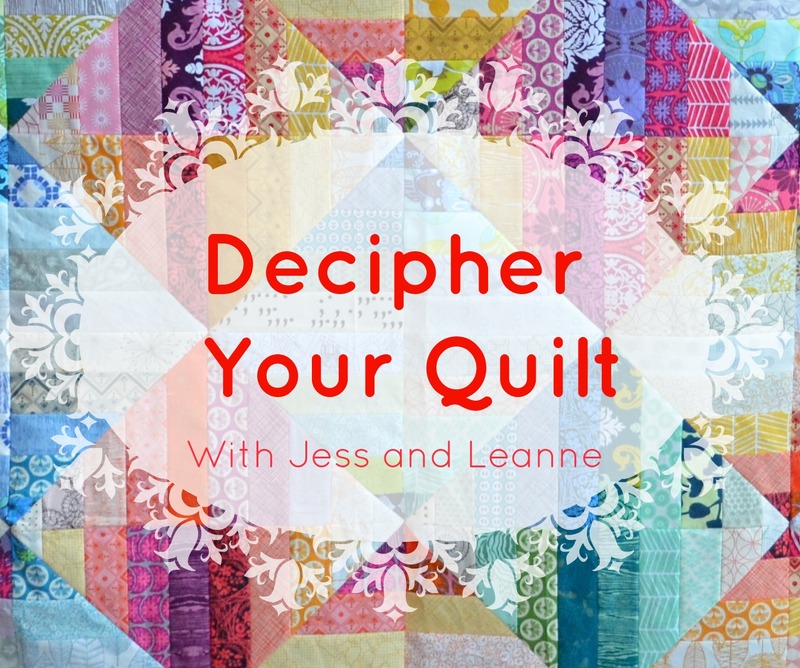 In the coming weeks of Decipher Your Quilt, Jess and I are dividing up our weekly topic, rather than both talking about all aspects of it as we have for the first two posts. Our next topic is 4 patch blocks. Don't forget to head over and read Jess's post about 2 patch blocks. If you share your practice projects on instagram, use the hashtag #decipheryourquilt so we can come and see them, and feel free to add them to our flickr group too. You can grab our button here. And feel free to leave your questions. I am still catching up on last week's questions but I will get there, I promise. I have laughed my way through your whole post Leanne - it is eerily similar to mine in so many ways! Great post! So looking Forward to read this series of Posts :). Great idea!!! Loving this series so much! Very informative. I think I will look for that blockloc ruler as I love hst but not the trimming. Thanks for doing this series! I troll the internet constantly reading tuts on HSTs and I have never seen the method resulting in 8 HSTs before. Yes, I dread HSTs but the part I dread the most is putting them together and matching up those corners! Another way to make HSTs is with Creative Grids Curves for Squares ruler - gives a gentle curved line in the HST and provides a wonderful spine for feathers when quilting! Bonus :) Provides great movement too! I, too, have never seen the 4 and 8 triangle option. Good stuff, Leanne! Wow! You covered so much. I've tried all those ways and admit I usually end up going back to no 2 most often. Starching fabric can really help if you want to use the four from two squares or. Eight from two squares method. Funnily enough it's not sewing the HST unit that causes me fits, but sewing multiples together afterwards, I swear the little buggers shrink! Thanks for pulling all this together in one place. Here's little trick I picked up online somewhere that works for the 2 at a time HST and eliminates drawing the line. Put a piece of tape on your machine marking the 1/4" seam allowance but extend the tape out in front as far as you can. Then you line up the points of the square on this tape and keep the point on the tape as you sew. It really works as long as you are making oversized blocks and speeds up the process since you don't have to draw all those lines. A really interesting post - thank you! Wow this is full of helpful stuff! Thanks! Bravo! I've already seen this post linked from another blog I read, so obviously it is having an impact. A good reference, forever and ever.